Party Season off to a flying start! We’ve had a great start to the year here at Lightning – here is a little look at what we have been up to. Collaborating with a long-standing favourite client of ours, we produced a two day extravaganza set in the beautiful grounds of Lucknam Park. On the first night we designed an elegant and sophisticated English Country look creating a laid back party atmosphere. Our technicians and crew then worked through the night to completely transform the room into a chic nightclub for the following evening. 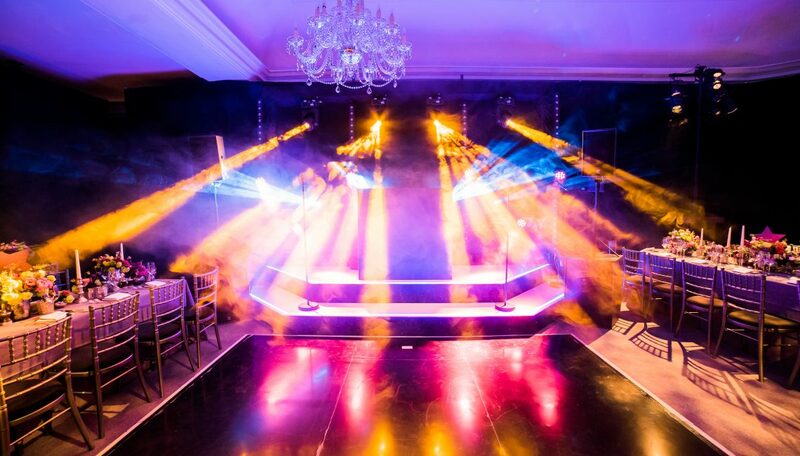 With the walls all draped in black, a new carpet laid, a bespoke stage and stunning lighting design, the transformation was dramatic. Last month we were commissioned by Sherlock Parties to design and produce a surprise birthday party in Hampshire. As part of the entertainment for the evening we built a working replica set for a spin off version of the popular British quiz show ‘University Challenge’ which saw guests battle it out for the winning title. With fully functioning buzzers and like-for-like team stations, the set really brought the game to life and proved brilliant entertainment for the evening. Last month, Lightning provided all design and technical production elements for an exclusive evening hosted in the City to raise funds and awareness for a charity. Guests entered through a stunning floral forest created by Elizabeth Marsh Floral Design. Each room was themed and designed to create a completely different feel. From the traditional panelled dining hall to a modern, vibrant, nightclub with video dance floor. We are delighted to announce that we are now an approved production supplier at the Garden Museum. Situated by the River Thames, the Garden Museum provides the perfect location for wedding receptions, corporate events and parties. The Museum’s garden provides a wonderful escape from the hustle and bustle of central London.